260 people in our community are currently praying with you. 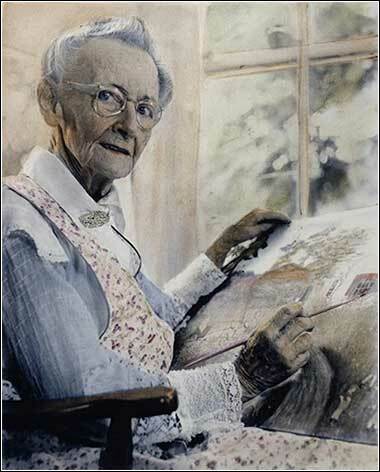 Grandma Moses, who painted her first picture at (about) age 76. The Lord appeared to Abraham near the great trees of Mamre, while he was sitting at the entrance to his tent in the heat of the day. Abraham looked up and saw three men standing nearby. When he saw them, he hurried from the entrance of his tent to meet them and bowed low to the ground. He said, "If I have found favor in your eyes, my lord, do not pass your servant by. Let a little water be brought, and then you may all wash your feet and rest under this tree. Let me get you something to eat, so you can be refreshed and then go on your way — now that you have come to your servant." So Abraham hurried into the tent, to Sarah. "Quick," he said, "get three bags of fine flour and knead it and bake some bread." Then he ran to the herd and selected a choice, tender calf and gave it to a servant, who hurried to prepare it. He then brought some curds and milk, and the calf that had been prepared, and set these before them. While they ate, he stood near them under a tree. Now Sarah was listening at the entrance to the tent, which was behind him. Abraham and Sarah were already old and well advanced in years, and Sarah was past the age of childbearing. So Sarah laughed to herself as she thought, "After I am worn out and my husband is old, will I now have this pleasure?" Then the LORD said to Abraham, "Why did Sarah laugh and say, 'Will I really have a child, now that I am old?' Is anything too hard for the LORD ? I will return to you at the appointed time next year and Sarah will have a son." Of all the messages in this wonderful Bible story, the most inspirational is Sarah's pregnancy. Sarah was old at the time. Not only was she past childbearing age, but she had been infertile even in her youth. The idea of getting pregnant made her laugh; it was utterly absurd. She was resigned to living out her life in a strange land, wandering around with her peculiar husband and serving him. But not only did she did get pregnant, but the child she bore would be the father of Israel, the founder of Judaism. As people get older, they tend to look backwards more and more, often with regret. We see the future less as a time filled with possibilities and potential. Our future seems shorter and shorter compared to our past, our powers seem to diminish, and the possibility of great achievement seems less and less likely. But here, we have the Bible telling us the opposite tale. And not just the Bible, but also every era of history, tells us that there is no reason, other than a self-imposed restriction, that people can't reach their greatest achievement in old age — often in an entirely new field. Michelangelo designed the dome of St. Peter's at age 83, in a time where the average lifespan was under 40. Oliver Cromwell was a marginal gentleman farmer with little military training when, inspired by his Puritan faith, he raised a troupe of cavalry at age 43. Grandma Moses, an unschooled farmer's wife, was in her mid-70's when arthritis forced her to give up her hobby of embroidery — so she started painting! Harlan Sanders' roadside restaurant was bypassed by I-75 when he was 65, so he started helping other people fry chicken. I'll stop there. This isn't the place for a list of late bloomers and new careers. But age is not an impediment to great works, even in a totally new field. We should not delude ourselves that we are incapable of something, solely because we are older than we used to be. Everyone is older than they used to be. Contrary to popular mythology, you can learn a new language at any age. You can learn computer programming. You can reach a new level of achievement or success in a field in which you have practiced your entire life, or you can start working in a field completely unrelated to anything you have ever done. Those who tell you differently are wrong. It's never too late.